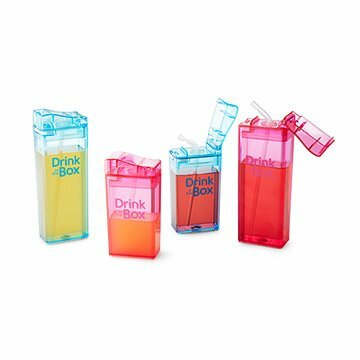 Keep the juice box tradition alive while being staying eco-friendly with this reusable juice box. Did you know that the average composite juice box can take over 300 years to decompose? That's a lot of years for each lunchbox staple. Keep the snack time tradition alive while being mindful of your ecological footprint with this reusable juice box. BPA and Phthalate free, the fillable design allows you to choose the juice (and sugar content!) that your kiddo sips, perfect for serving up fresh squeezed beverages in a fun, well-balanced way. Lightweight and durable with a stainless steel hinge, lockable latch, and silicone seal, this leak-proof design lets little ones take their healthy hydration on the go. Made in China. Here's a tip to ensure a leak free seal: leave the lid open when putting on the top to allow excess air to escape before closing the lid. Here is a tip to ensure a leak free seal: leave the lid open when putting on the top to allow excess air to escape before closing the lid. So glad to find these drink boxes! We've used the "Juice in the Box" version of these for years, and I'm so glad to find them again - plus a larger version! Once I learned how to use them correctly (see other review), I've had no problems with leaking. I use them in my kids' lunch packs, and to take on road trips and hikes. Love that we can use them again and again! We use these cups everyday, at home, school, or on the go! Fantastic - we own 4! My daughter has used a juice in the box or drink in the box daily for over a year. I did not purchase then through this site, but when I saw negative reviews, I wanted to share my opposite experience. I wash the boxes daily - top shelf, slide the straw over one of the dishwasher spindles, and lay the lid sideways on the 3rd rack of my washer, in the open position. After they're washed I lay all the pieces on a drying rack so that air can flow through them, even after running the drying cycle. We've never once had a mold issue or buildup of any kind. We started with 1 Juice in the Box, then added 2 more. I purchased a Drink in the Box this summer since it was a larger size for a longer day of preschool. The only time I see a leak of any kind is when she pops it open to sip... Sometimes the water is already in the straw and it shoots out a bit. If the adults washing/drying/piecing them back together are diligent in these easy tasks, there shouldn't be any problems. We added a Snack in the Box recently and find it so handy for lunchtime snacks like carrot sticks or grapes. Love that we're not loading her up with sugary juice boxes, plus it's more economical to use your own juices or water. They've been dropped numerous times... No cracks, thankfully! Very disappointed that this start leaking fluid after 3 uses, never put in the dishwasher. Got this as a gift for my daughter who starts kindergarten :( in 2 weeks. We did a trial run when i didnt want to pack a bunch of juice boxes on a beach trip. Ended up meeding to rince off swim suits cause they had juice on them. I fill these with chocolate milk and put them in my daughter's lunch every day. They've never leaked. Easy to wash, too. Highly recommend. The juice boxes are durable, machine washable and a great idea. They are a perfect size, a little larger than regular disposable juice boxes. They seem to seal very nicely but when jostled in a linch bag, they leak.